WADESBORO — The iconic work shed from the classic horror movie “Evil Dead II” has been saved, thanks to a West Virginia fan. 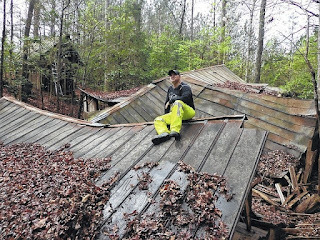 Mike Pasquale made the trip to Wadesboro last month from his home in Weirton, West Virginia — just outside of Pittsburg, Pennsylvania — to save the shed. Pasquale documented the adventure he called “Operation: Evil Dead Uproot” on his website, EvilDeadWorkshed.com. The cabin from the movie had completely collapsed, and the shed was also in bad condition, Pasquale said.